ITEM #USA-1001AT Rolling stand & ITEM#USA-1001T Table clamp. Easy to use and comes w/convenient rolling stand or table mount to affix to a table or anywhere you want. * On/off switch.“* Front shield to protect bulb.“* Arm rotates 180 degrees.“* Arm moves up and down.“* Casters for mobility“* Lamp arm: 19″- 38″“* Base: 24″ x 24″“* Weight: 14 lbs.“shipping charges extra. This will not appear on your internet order, only your invoice. Item#USA-1006.Modern LEDs lamp of cold light with a 5X magnification. The intensity of light can be adjusted. Its articulated arm eases the movement and lamp fixation safely. It comes with a high-stability 5-wheel base.please note,all shipping charge are extra.these charges will not appear on your internet order,only your invoice from us. Item#-USA-1006T.Modern LEDs lamp of cold light with a 5X magnification. The intensity of light can be adjusted. 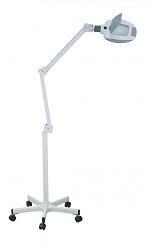 Its articulated arm eases the movement and lamp fixation safely. It comes with a table clamp. please note,all shipping charge are extra.these charges will not appear on your internet order,only your invoice from us. Item#-USA-1005.Modern LED lamp of cold light with 5X magnification. It is equipped with a switch to adjust the light intesity in 2 different positions. 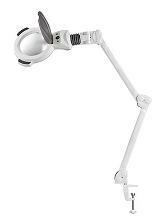 Its articulated arm eases the movement and lamp fixation safely. It comes with a high-stability 5-wheel base.please note,all shipping charge are extra.these charges will not appear on your internet order,only your invoice from us. 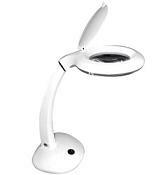 Item#USA-1005T.Modern LED lamp of cool light with a 5X magnification. It is equipped with a double position switch to adjust the light intensity in 2 different positions. Its articulated arm eases the movement. It is provided with a clamp to be fixed on tables or beauty trolleys. please note,all shipping charge are extra.these charges will not appear on your internet order,only your invoice from us. 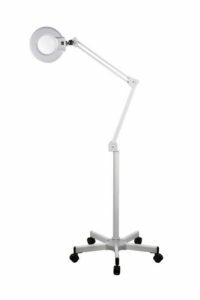 ITEM #FANT-FSC-860.12 Watt magnifying lamp features a flat base with an on/off switch and a flexible arm that measures 13″H. 3-1/2″ diam. magnifying optical lens has a flip down dust cover.please note,shipping charges are extra.this will not appear on your internet order,only your invoice recieved from us.